"Lufthansa says that if Ryanair was stripped of free or subsidised airport services in addition to cash, in the form of “marketing support”, it would lose money. “If all the airport subsidies and support paid to Ryanair were taken away, its economic situation would be very different,” says the Thomas Kropp, a spokesman for the German airline." "Not only were some airports providing free staff for Ryanair check-in desks, they also cleaned the planes for nothing. 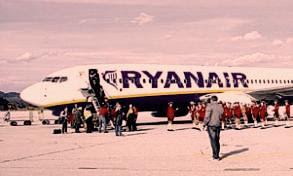 Ryanair aircraft often landed free of charge, and where fees were charged they were offset by the massive “marketing support” demanded by the airline. This marketing money meant that, in return for cash running into many millions, the airports and their regions were promised publicity on Ryanair’s website and in its in-flight magazine." Not content with massive state subsidy, Ryanair is also alleged to be avoiding taxes by employing staff in continental Europe on Irish contracts, thereby significantly cutting its payroll tax bill. The Belfast Telegraph reports that Ryanair is under investigation by French authorities for avoiding up to €4.5 million in payroll taxes due on staff employed full-time in France. Under European Union law staff can only be employed on contracts issued in another EU state if they are either working on a temporary basis or are genuinely employed in a variety of different countries. "French social security and other payroll taxes are up to three times higher than in Ireland and fall especially hard on the employer. By employing French-based staff on Irish contracts, Ryanair is accused of gaining an unfair competitive advantage and, in effect, cheating the French government." So there we have it. For all the loud-mouthed bragging about efficiency and innovation, Ryanair - and other low-cost airlines - base their business model on state subsidies and aggressive tax planning. We wonder what all those starry-eyed punters who sang the praises of the Celtic Tiger think about this. Err, but I thought you lot were in favour of regional policy through targetted tax and governmental subsidies? Au contraire. We consider most such tax incentives to be market distorting and harmful to public interest and the ecology. Its not even as if Ryanair and its rival low-cost airlines are new kids on the block, so we're not dealing with a start-up situation or addressing a market failure. But why no comment on the aggressive tax avoidance?